Moving homes is kind of a big deal. Cor Movers wants to make sure you’re stress-free, comfortable with moving your valuables, and getting them safely to your next home. Whether you’re in a condo, apartment, or house, Cor Movers can help you make your next residential move easy and hassle-free. 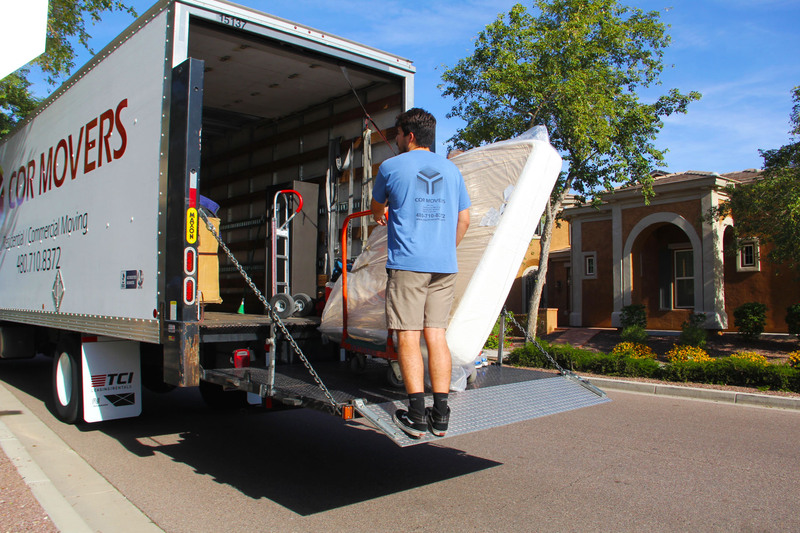 Cor Movers is one of the fastest movers in Phoenix, Arizona while still being extremely careful and delicate with your vaulables and possesions. Call 480-426-1933 to schedule your next move with Cor Movers. No matter what sort of apartment or condo complex you live in, we are able to move just about anything up any amount of flights. We are fairly priced and will make your Apartment & Condo Move a smooth transition – relocating your furniture and electronics without a scratch. You can either fill out one of the forms on this page, or you can also give us a call at 480-426-1933. This is when we’ll collect more detailed information about your move and give you an estimate. We’ll take it from here. Our movers will come at the scheduled date and time ready to move you to your new home! Moving checklists provide great tips and give you a heads up before, near, and on your moving day. Read more below for tips you should follow 1 month before your move! We don’t only move homes and apartments, but we can help with other services that can make your move smoother. Packing can be a pain. But if you you’d like to save the hassle, we can go ahead and help you pack your belongings. Just because it’s not an appliance, we can still move other large items like desks, sofas, or anything else you may need. You want to make sure your valuables are safe and sound, and we promise we will keep them in one piece while moving. If you have stuff you don’t want to keep when you move, we can help you get rid of it. From old furniture to almost anything. "Cor was recommended by and coordinated with Phoenix Carpet Repair and Cleaning. Three guys showed up on time. Friendly, well mannered, professional and careful, I watched them effortlessly complete the job just as the carpet tech showed up. They constantly asked if placement was okay and/or if I had preferences where other items would go. I would definitely use them again!" "The best !!! In 34 years of marriage my wife and I have moved 15 times and Dan and his guys were the best we've ever had the pleasure of doing business with. At best, moving is stressful and can be a huge pain in the backside but Cor Movers did EVERYTHING right. An awesome group." "This is an absolute amazing group of people! They treated our home, family and property with the utmost respect. They showed up with amazing attitudes, and worked VERY quickly to move our stuff. And although they were fast, they were very through with the way they pack all of our belongings. There was absolutely no damage or scuff on any part of our furniture or house. This is the BEST moving company out there, from owner right down to crew. If I could give them more than 5 stars, I would! BEST MOVING COMPANY IN ARIZONA! Cor Movers has been moving people forward for over 10 years with commercial and residential Moves. And 5 years ago we added junk removal. Are your men your guys or home depot labor? Cor Movers is located in Central Phoenix, Arizona. Check out our location page for more information on locations we serve. What kind of truck do you have? A 2015 Hino truck with a rail lift gate. Its 26 feet long and is like-new. Residential moving is charged by the hour. Junk removal and commercial moving is charged by a flat rate. Do I need to put a deposit down for the move? Yes, you do. For a commercial or junk removal job, we need a 50% deposit. For a residential move, we need a $50.00 deposit. What time will you be at my home or place of business? Between 8 to 9 in the morning, but we do what works best for the customers, just request a time the fits your schedule. Do you charge a trip charge? Yes, we charge a one hour trip charge whether it’s a commercial move, junk removal or residential move. How many guys will you be sending? For a standard job, we always send at least three guys. Yes, we do. We have a general liability policy which covers damages done to floors and walls. We have a care custody and control policy as well which covers damages done to the client's furniture. We also have workers comp.